This activity looks at the animals that live in the mountain regions of the UAE, using the environment around Jebel Hefeet near Al Ain as an example. There are many animals that call this mountain home, and a lot of them are endangered or at risk. 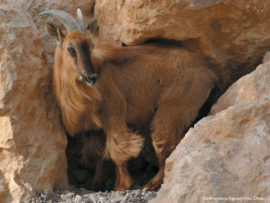 Learn about the mountain regions of the UAE and the animals that live there. Find out which animals are endangered and what your students can do to help. Create a poster or collage to increase awareness of these animals and conservation efforts around them. Create a card game they can use to encourage other students to find out more about the animals they’ve learned about. التعرف على المناطق الجبلية في دولة الإمارات العربية المتحدة والحيوانات التي تعيش فيها. معرفة أنواع الحيوانات المهددة بالانقراض وما يمكن أن يفعله طلابك لمساعدتها. ابتكار ملصق أو مخطط توضيحي لزيادة الوعي بهذه الحيوانات وبالجهود المبذولة للمحافظة عليها. ابتكار لعبة بطاقات يمكن للطلاب استخدامها لتشجيع غيرهم من الطلاب على اكتشاف المزيد عن الحيوانات التي تعرفوا عليها. Can you Improve this Resource? We welcome ideas on how to improve our resources. If you have tried using this resource and have some thoughts on how to improve it please follow the instructions given in the document.